Sometimes it’s nice to keep things simple. 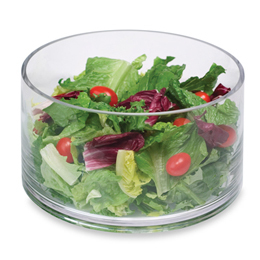 This Artland Simplicity Cylinder 9″ Glass Salad Bowl does just that. Perfect for serving a crisp and clean salad, the glass bowl lets the salad itself shine through. With a nine-inch diameter, and a modern cylindrical shape, the salad bowl is well suited for a variety of occasions. Any salad, at any time, will look great served from this sleek and simple bowl.